Two centuries on, SparkNotes, the US-based study guide website familiar to tens of millions under the age of 30, explains the passage in its “No Fear Shakespeare” section in a similar manner, saying that Shakespeare meant Wart could “advance and regroup faster than a brewer’s delivery pail can be refilled.” But like Johnson and Mason, SparkNotes is making a fundamental error: because “bucket” in this passage does not mean “vessel”. And Johnson and Mason made another mistake as well: for not only were the buckets not buckets, they weren’t hanging from a gibbet. The only Shakespeare commentator to get it right, or mostly right, seems to have been Sir Sidney Lee, editor of the Dictionary of National Biography, in his Complete Works of Shakespeare of 1906. Lee pointed out that “bucket” here is clearly the separate word meaning “beam or yoke on which things may be hung or carried”, from the Old French “buquet”, meaning “trébuchet, balance”. 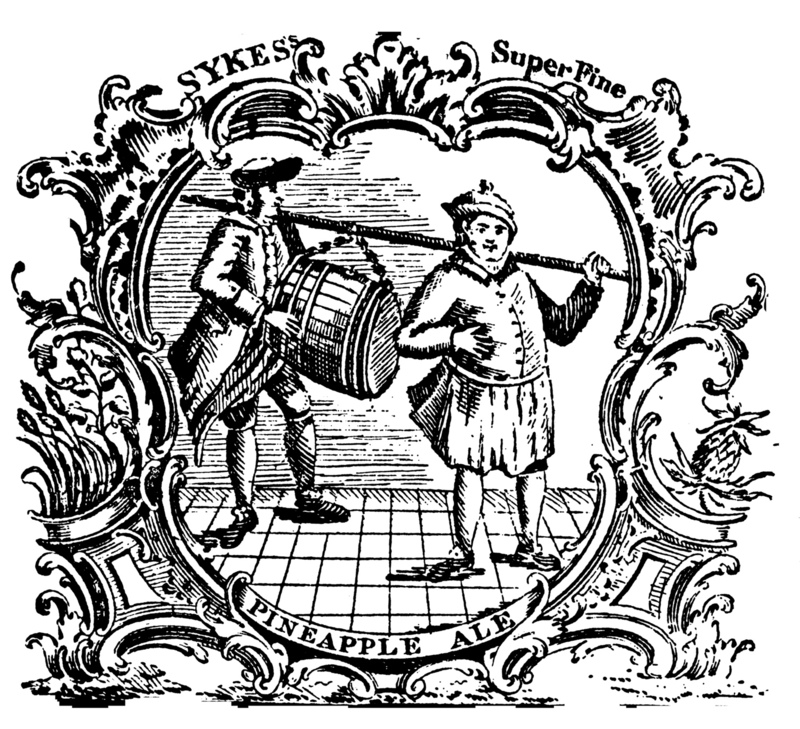 “Gibbets” means “hangs”, Lee says, and “The reference is to the practice of hauling about barrels of beer by attaching them to chains depending from a beam borne on the shoulders of the brewers’ men,” so that the passage means “swifter than he that hangs barrels on the yoke of the brewer’s men.” “The attribution of swiftness to this method of haulage is ironical,” Lee says. 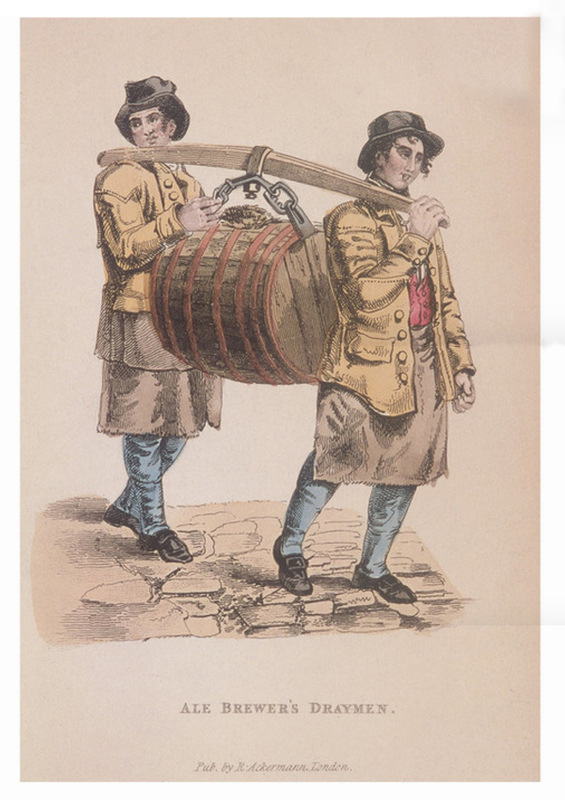 Multiple illustrations over several centuries show brewery workers carrying around casks suspended by chains from a yoke they support on their shoulders: it looks to have been a common method of transporting full casks. The yoke is the bucket. Confusingly, while gibbet can mean a pole from which something is hung (which is what Johnson and Mason thought the word signified in the passage from Henry IV), here it looks to mean the chains and hooks that attach the cask to the bucket. The records of the city of Aberdeen in 1477 mention “A brewyne fat, a hemmyr stand, a bukket, and a gybbate that it hang by.” In Scotland, where the “gibbet or swee” was the name given to the chimney-crane that supported a pot over the kitchen fire, which was “attached to [the swee] by a strong double hook called the gibbet-gab”, exactly that double hook on a chain you can see hanging from the bucket on all those pictures of draymen. You will have spotted, I hope, that Lee looks to be in error with the claim that “‘Gibbets’ means ‘hangs’.” “Gibbets on” should more properly, I suggest, be “gibbets-on”, with “to gibbet-on” meaning “to attach something to a bucket or yoke with hooks on a chain” – just like the chap at the rear is doing in the illustration of the brewer’s bucket in use in Amsterdam. So why did Shakespeare use the act of gibbetting-on a brewer’s bucket as a metaphor for speed (or, if Falstaff was being ironic, for slowness)? If my maths is up to it, a full wooden barrel weights about four hundredweight, or 200 kilos. Even two men carrying the bucket on their shoulders would not be nipping about speedily. All suggestions for what Stratford Willy actually meant gratefully considered. Nice article, once again, Martyn. I like the origin of “kicking the bucket” – never understood that phrase before. 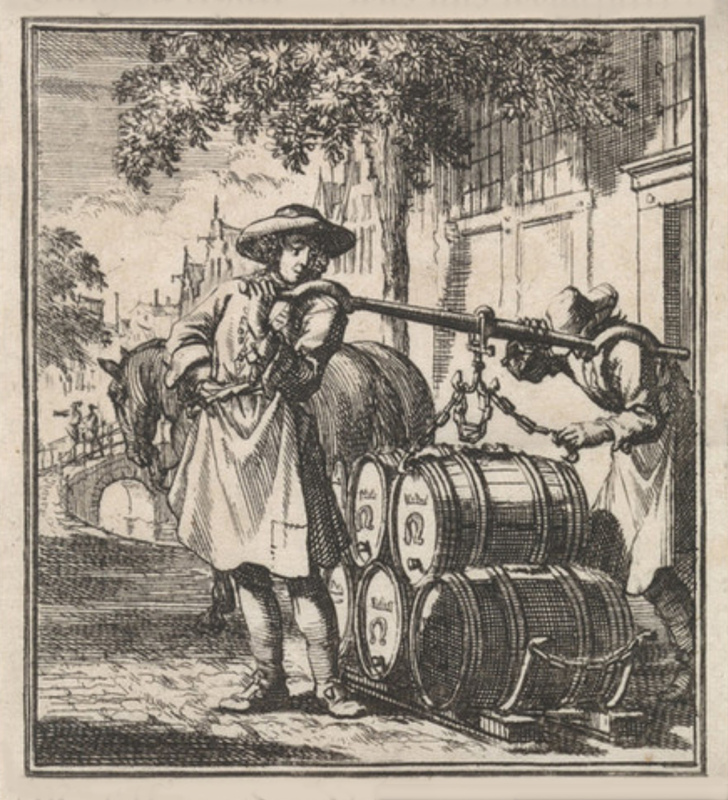 Two brewers dressed in similar 18th century-type clothes to your illustration and carrying a barrel of beer with a bucket have served as the logo for the Maes pilsner brand ever since I started going to Belgium in the early 80’s, and still do today. 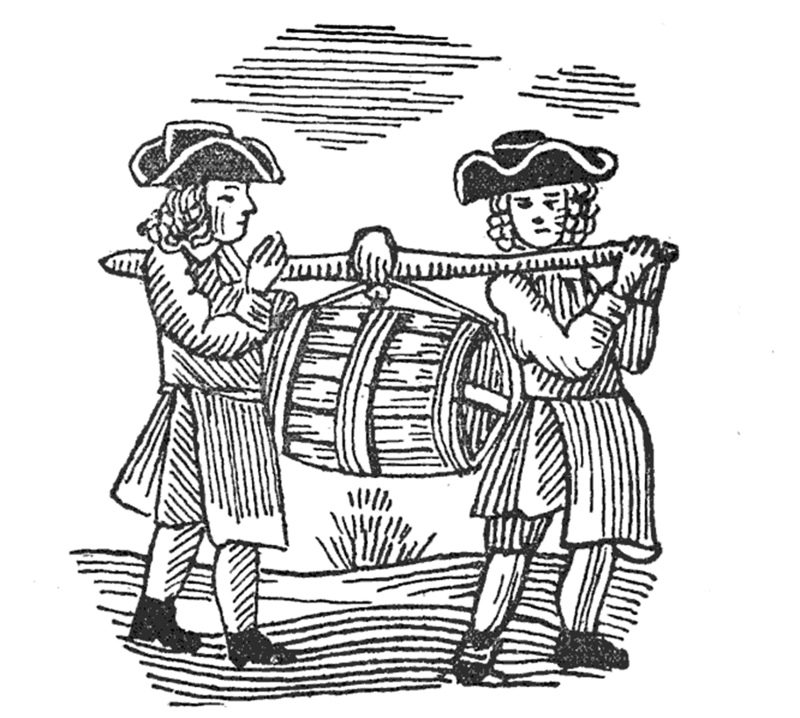 So a Hemmyr barrel is a Hanseatic barrel? I wonder if the “speed” aspect is to do with the rapid fixing / unfixing of those clips that seem to hold onto the rim of the barrel by simple force of gravity? Pick it up, it’s attached; put it down, it’s free. Rather like those amazing pipe lifting gizmos you see on cranes on building sites, or the lifting gear that used to be used in loading / unloading cargo holds. What this might have to do with gunnery procedures I couldn’t say! Shakespeare wouldn’t be above using “as fast as [a very slow thing]” as a gag, particularly if he could bury it in a stream of patter. I’m wondering about those pewterers now.